Hidden Bats info about the game-Games2Rule. Bats are hidden everywhere in the place. 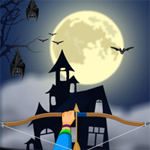 Find them and explode it using archer's bow and arrow.Unwanted clicks will reduce target time. If finding last 3 bats seems difficult use the hint option to find them but it will reduce 100 points.